These cups, they have everything i love in a tiny appetizer. Plus, they are cute. Everybody loves cute food. 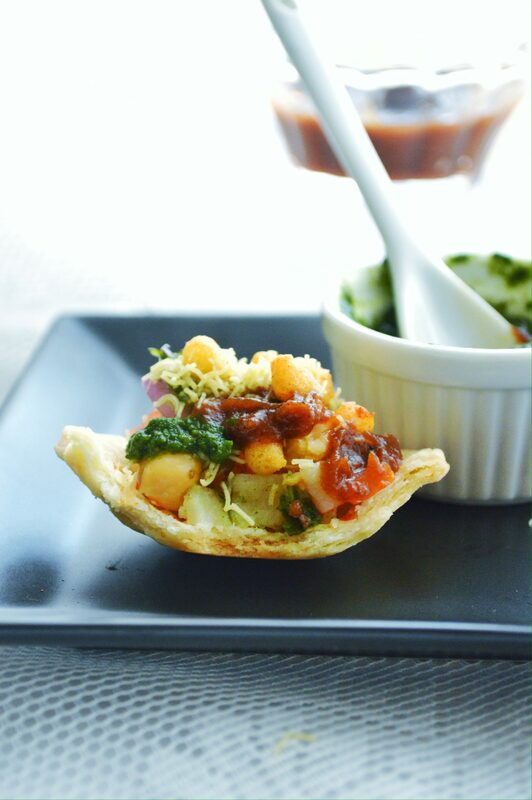 This is a fusion food, where i gave a makeover to our indian chatpatta snack named chaat. 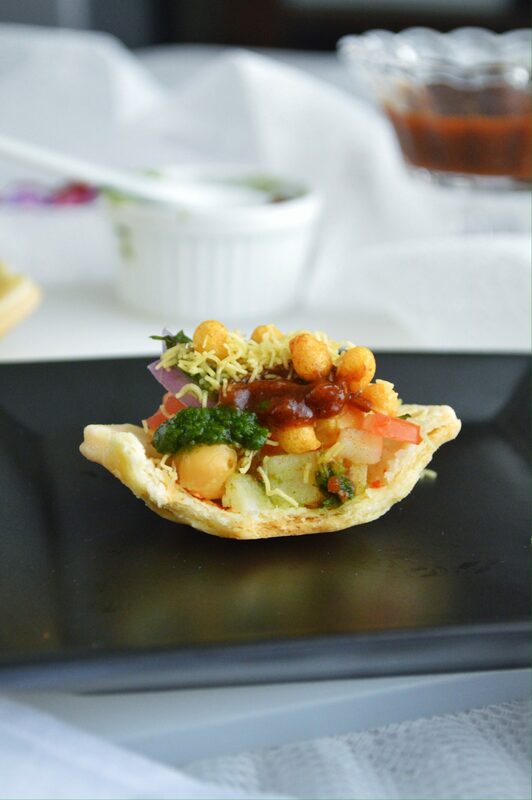 I served the chaat in a tart…sounds good right! 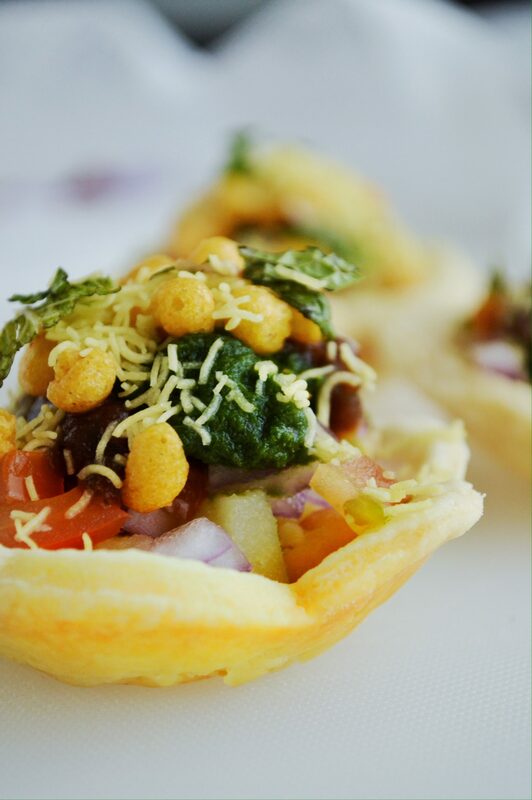 I love chaat. I can have it for breakfast, brunch, lunch, tea time and dinner. 😀 There are different varieties of it. So you know…different ones at different times…oooh yummm! 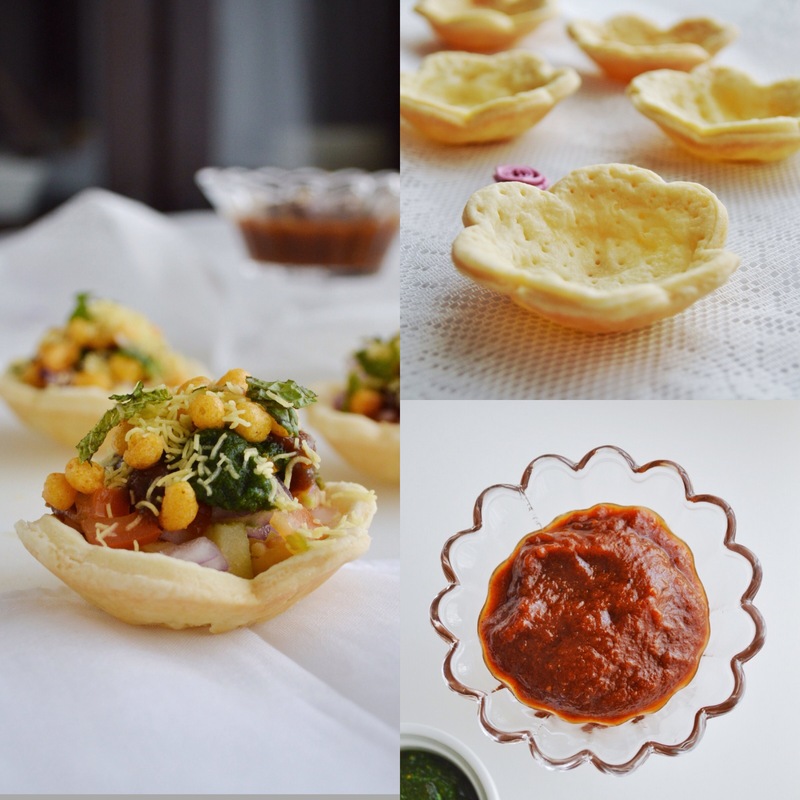 I wanted to make a variety named katori chaat. 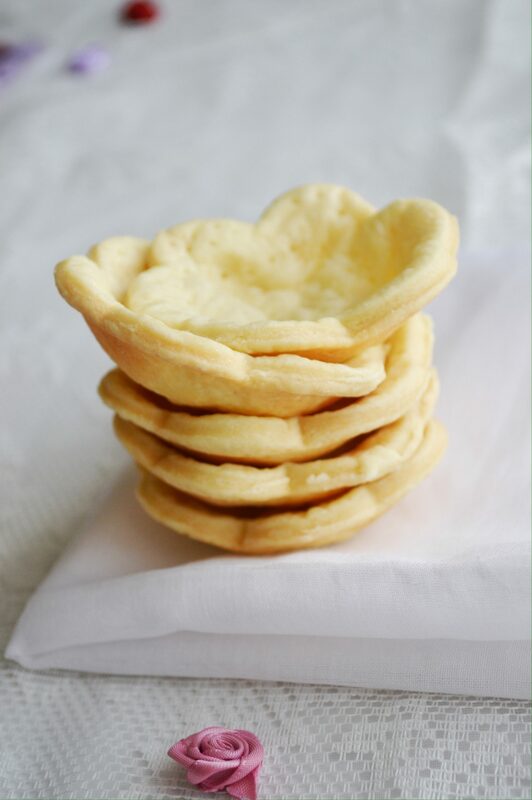 Katori means bowl, and i thought of making the traditional bowl with grated potatoes, where you grate the potaoes, add a little cornstarch and with the help of 2 tea strainers you deep fry these individually to get these gorgeous potato bowl, which would taste like potato chips. But i knew that it will be quite time consuming to make that and i absolutely, surely knew that i wont be able to make it now with a 6 month old baby. 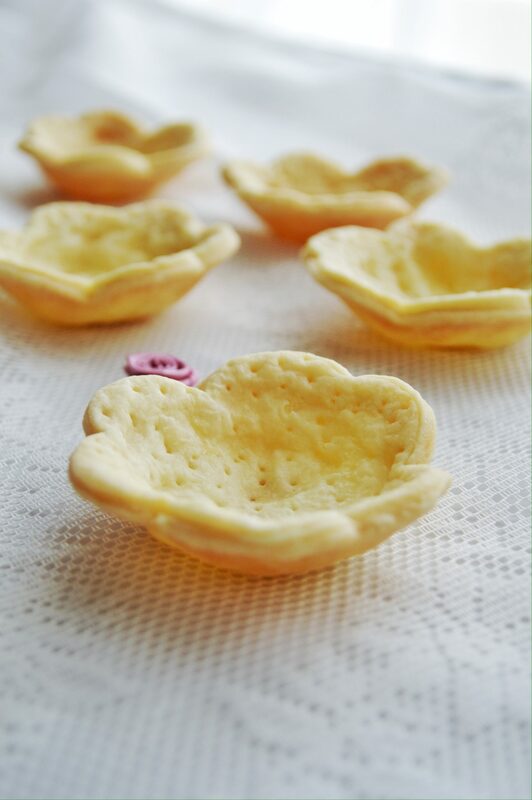 So, i thought why not make a tart shell, which is much more simpler to make and you can make many shells at a time. I made it and it was a super success. It had all kinds of texture and flavor in every bite. 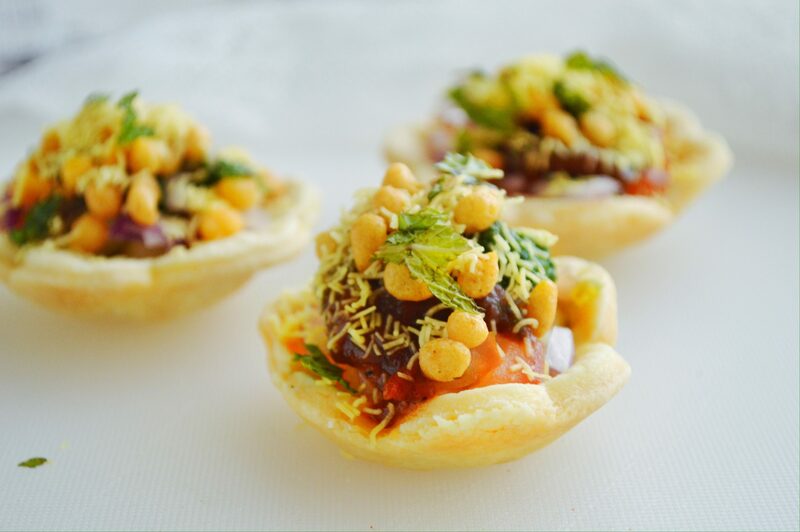 You feel the flaky and buttery tart, crunchy sev, refreshing veggies and the burst of spicy, sweet, tangy, and hot flavors from the two chutneys. 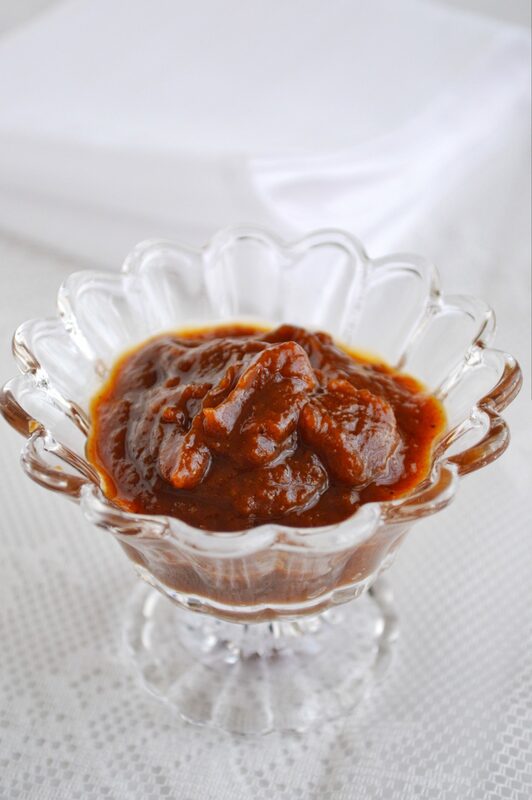 In short, it is sweet, tangy with a touch of spiciness, all in equal proportions thus giving a perfect balance of flavors. 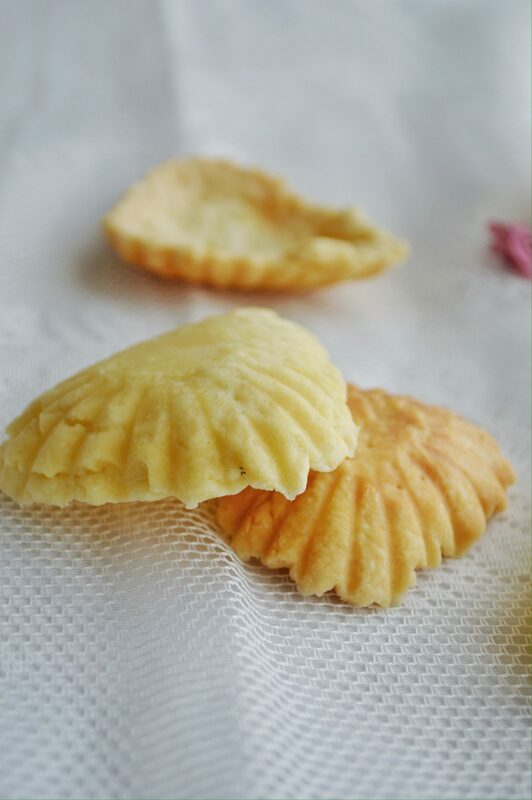 Get the recipe from here. 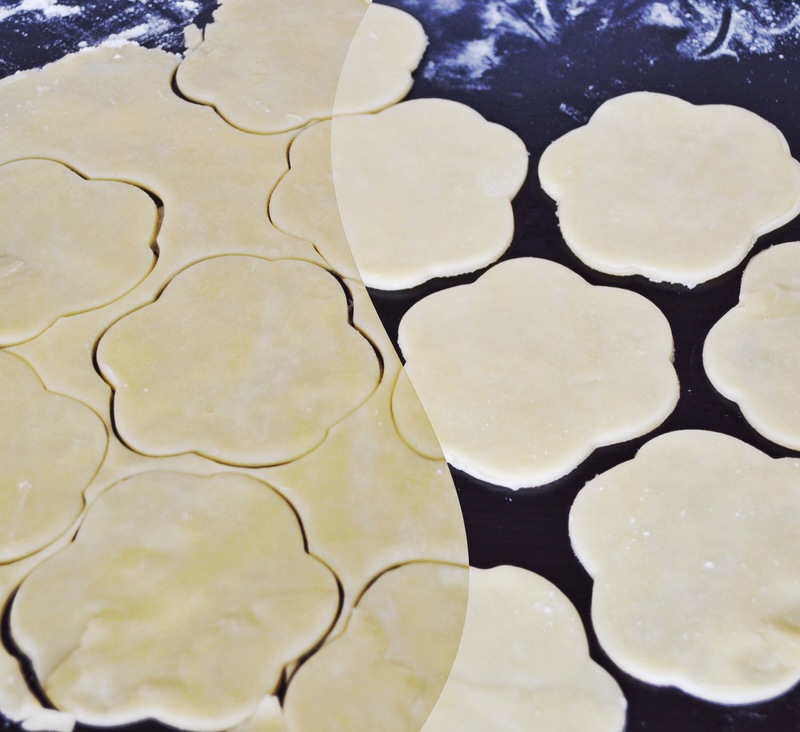 Follow the same recipe, but after rolling out the dough, cut them in rounds and place them in a tart pan. I cut mine with a flower shaped cookie cutter. 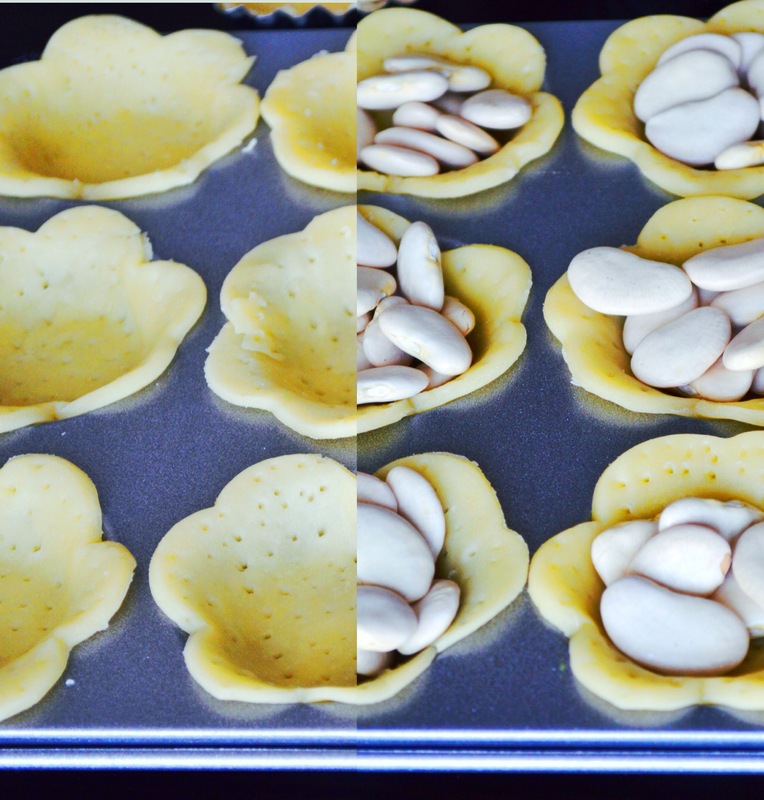 After placing them in the tart tin, poke holes all over it so that the pastry doesn’t puff up while baking. Then place over it some weight, i used broad beans. You can use rice or kidney beans too. 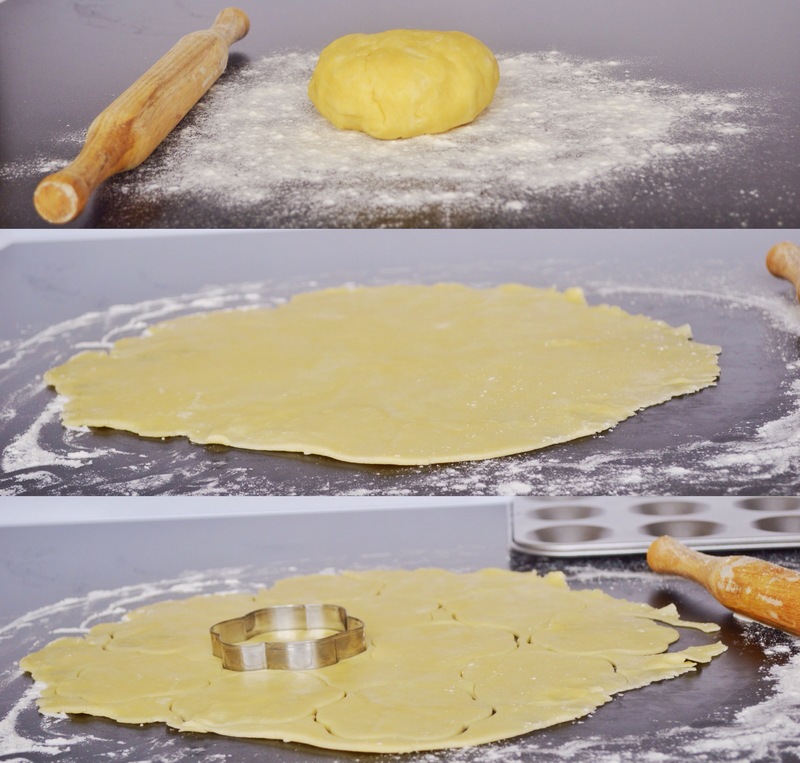 This is again to make sure that the pastry doesn’t puff up while baking. Place the tart in a 350F preheated oven and bake for 15 mins. Take it out remove the beans and bake again for another 10 mins till the tarts turn golden in color. 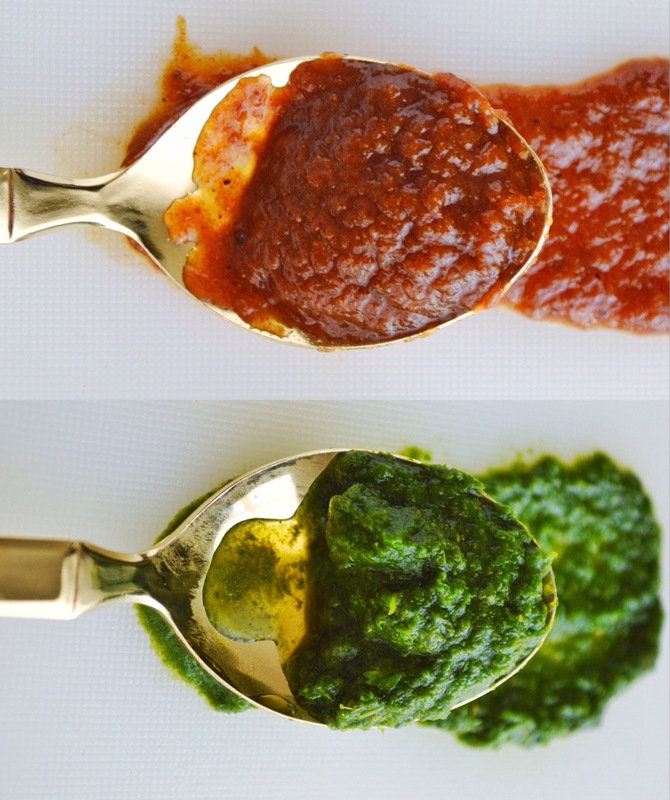 Grind everything to a smooth paste. Cook for 8-10 minutes till they turn soft. 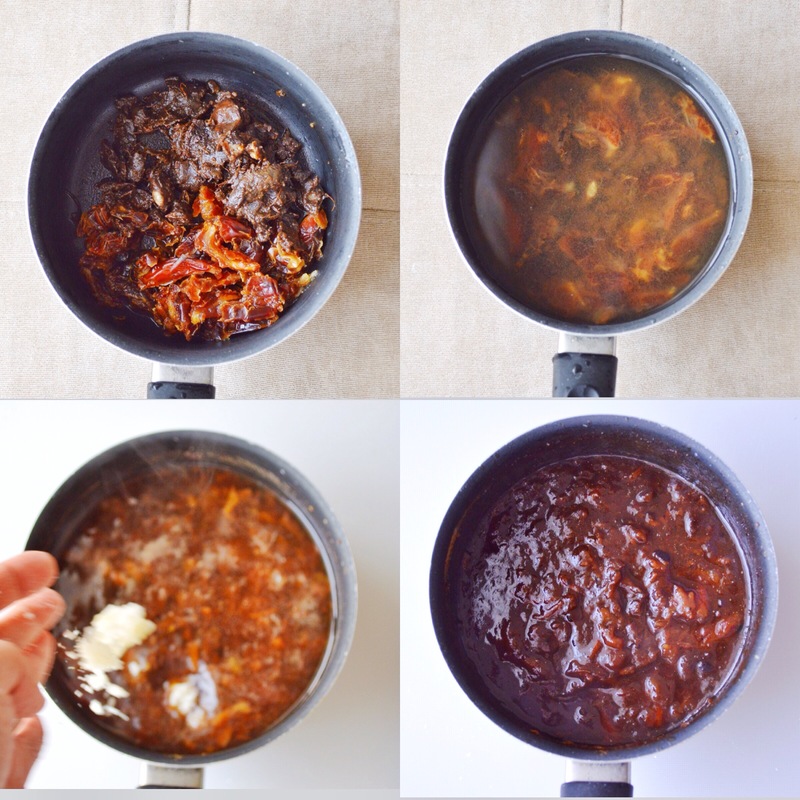 Add jaggery and cook till dissolved. 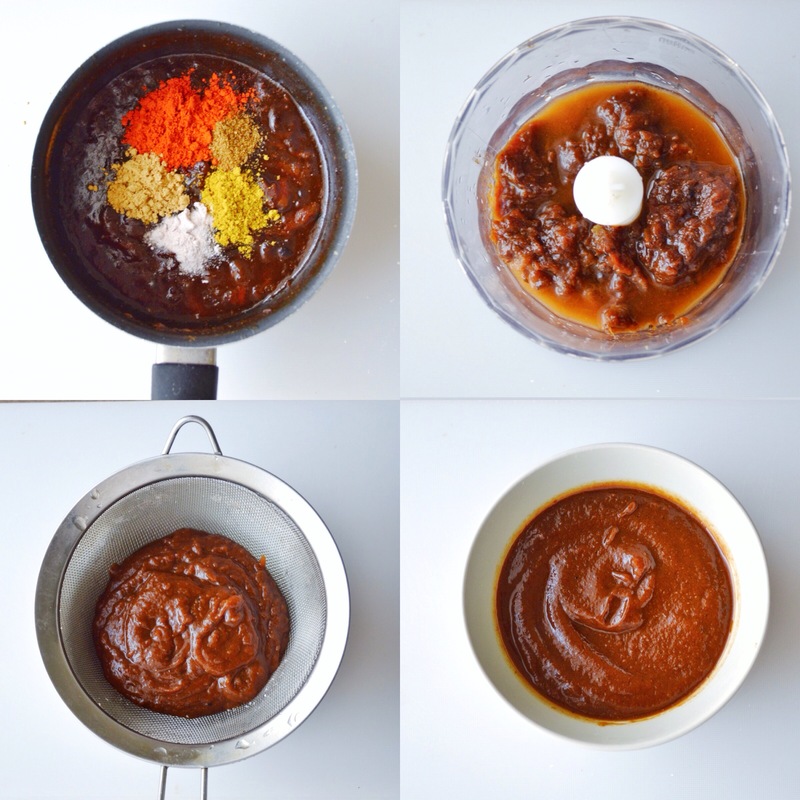 Let the chutney get thick. Add in the spice powders. Simmer for 1-2 minutes. Add salt. 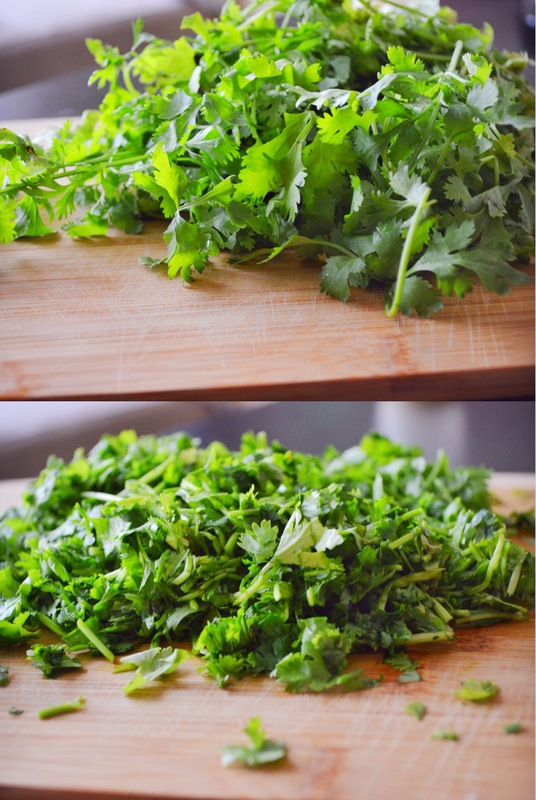 Grind this mixture till smooth, add little water while grinding. 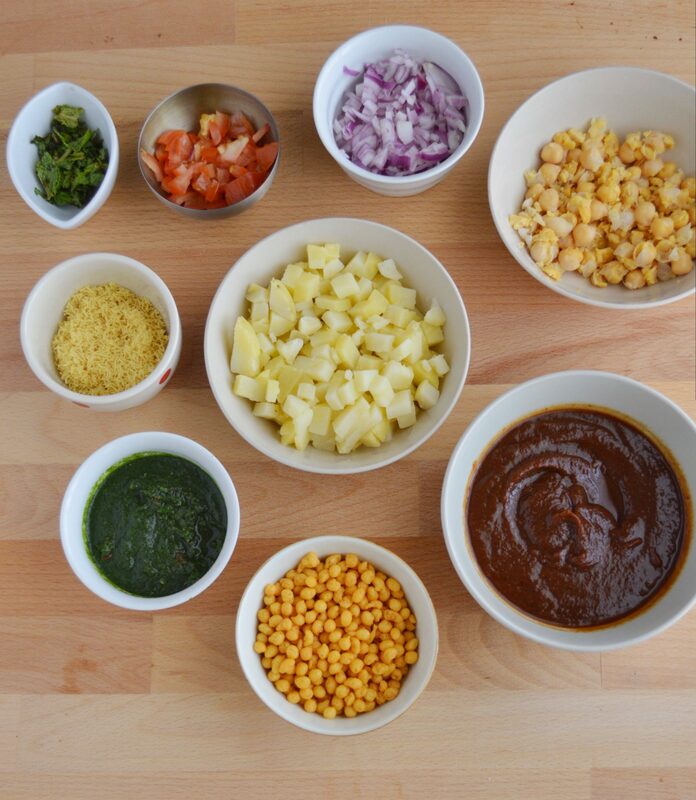 In the tart shell first add in little red chilli powder, then potatoes, chickpeas, onions, tomatoes, two chutneys, boondi, sev and finally coriander leaves. ✔️ You can add whatever filling you like. 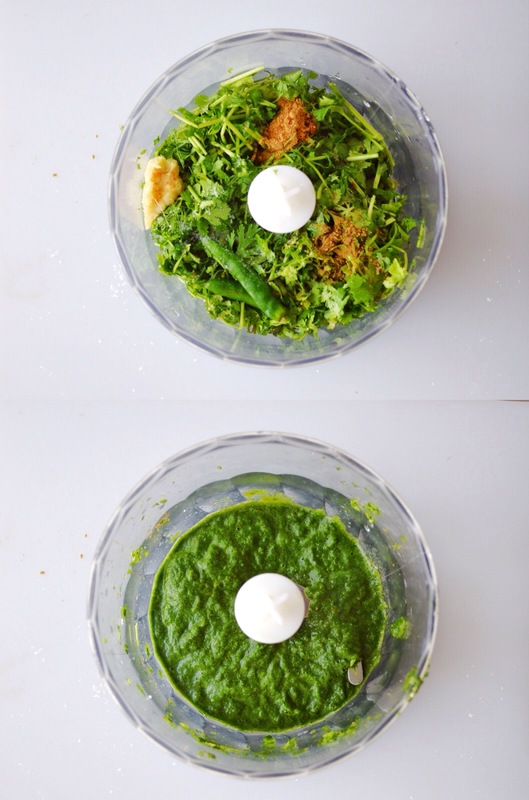 Add green mangoes, chaat masala, youghurt etc. ✔️ i used masala boondi. ✔️ Assemble the tart only right before you eat. Or else the tart shell will get soggy. * You can add whatever filling you like. Add green mangoes, chaat masala, youghurt etc. * I used masala boondi. * Assemble the tart only right before you eat. Or else the tart shell will get soggy. I love chat too and your tart baskets look amazing! I am drooling! As always, your photos are fabulous too! Awesome clicks dear. 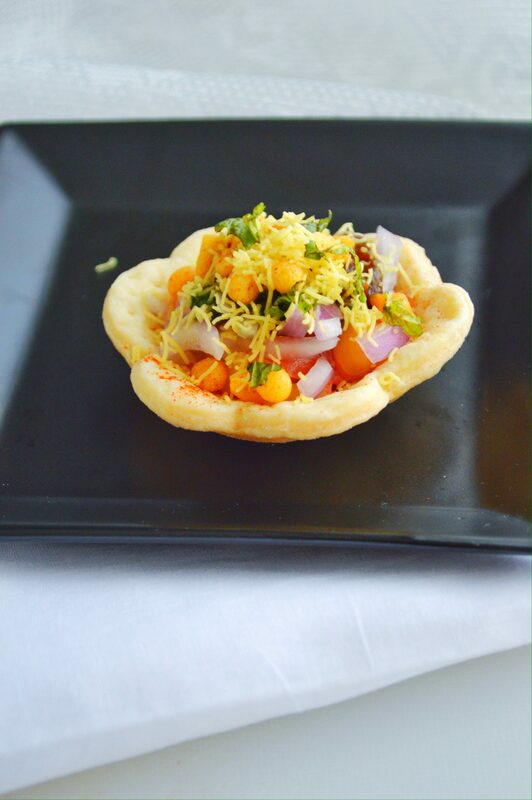 Love chaats and your tart twist is amazing. Beautiful Sadia!! Love those little bites. 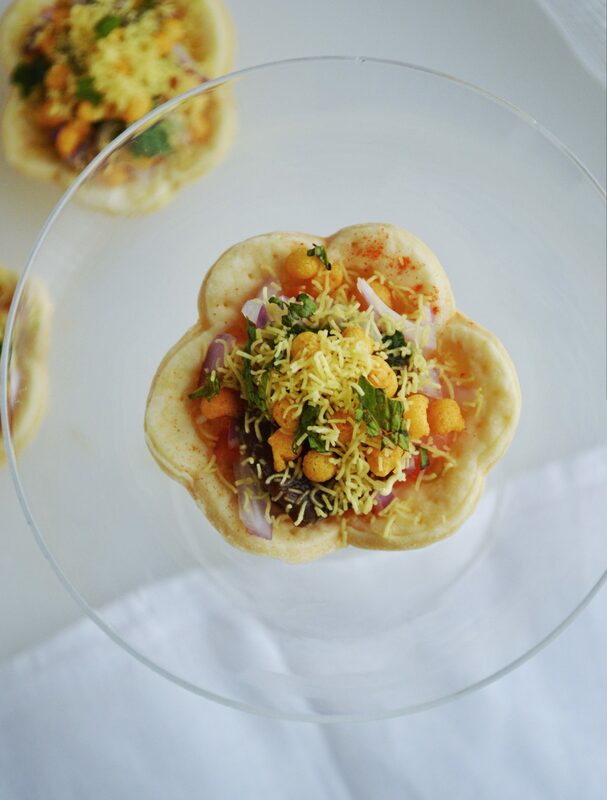 I loooovvvveeee chaat. 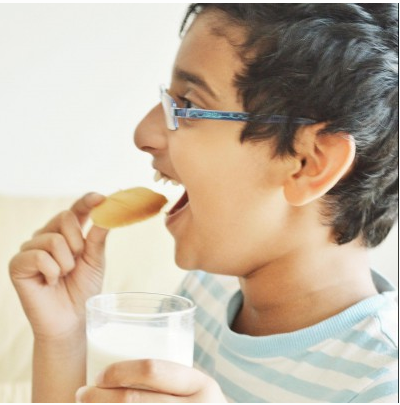 Like Sandhya, I am drooling over your pics. Stunning pics as usual. 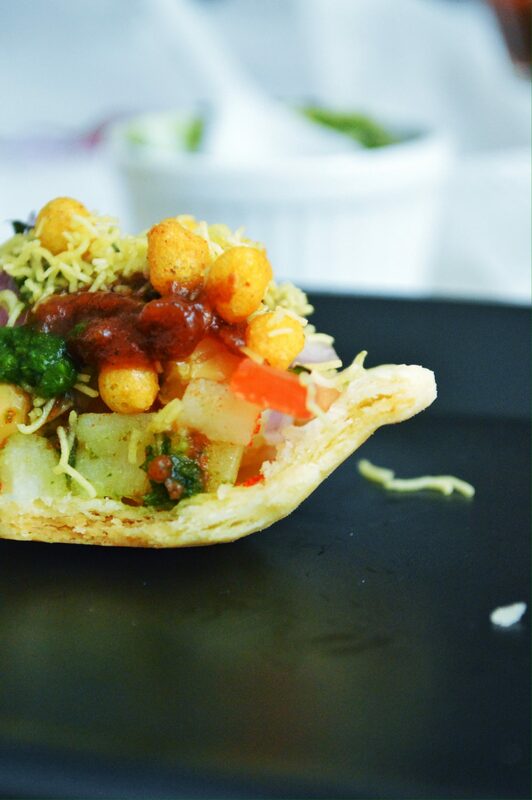 Do you think it is unhealthy to want chaat at 5 AM? 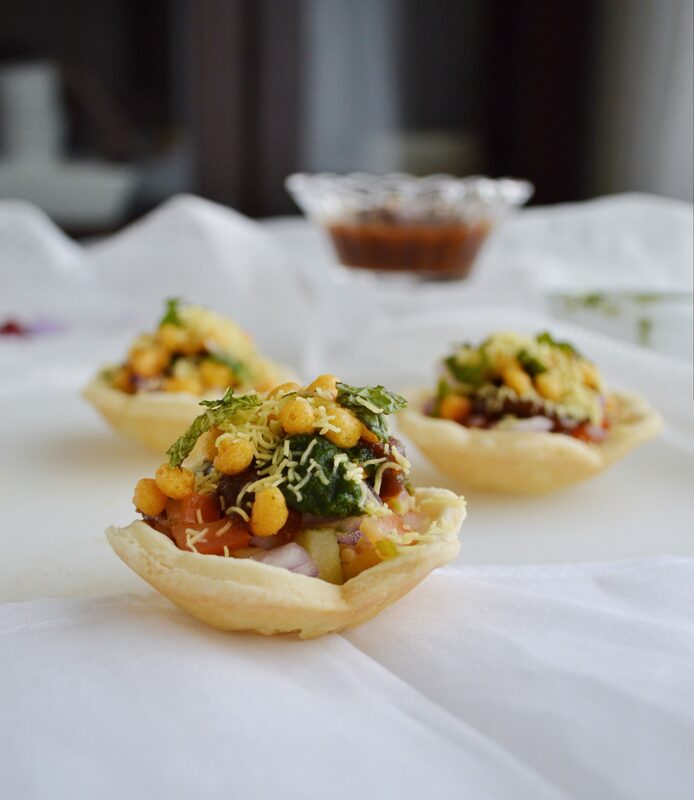 I love chaat and I love this – so much flavour packed into each little bite! Wonderful. Sadia, what a perfect click !! So many flavourful ingredients go into these! 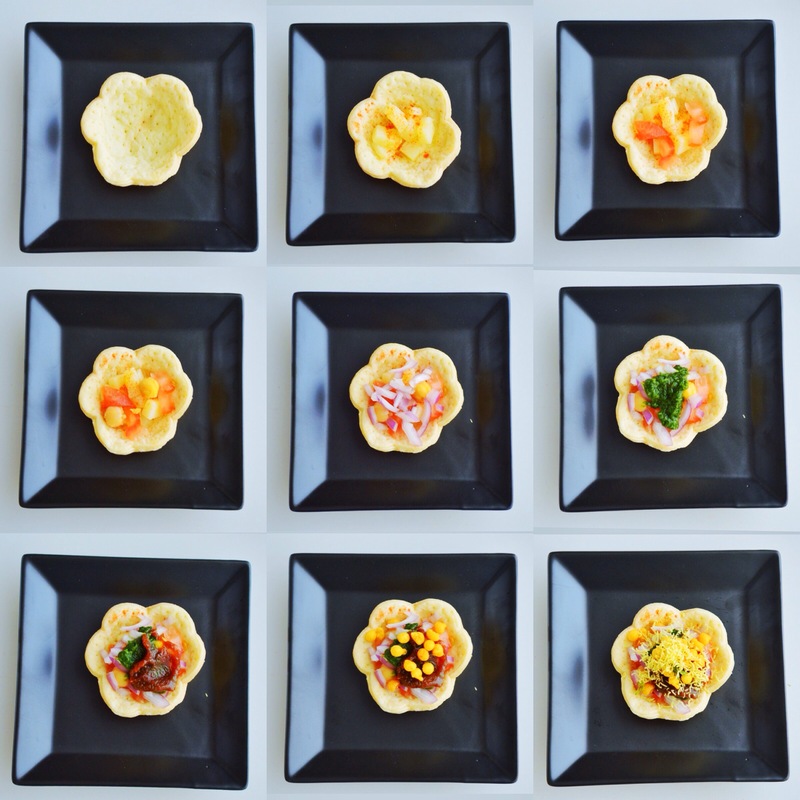 I love the clarity and descriptiveness of the photos… Especially the one with the tart shells and the beans!! They are soooooo cute, Sadia! Absolutely love these little tarts! Yummy! How unique and delicious, Sadia! I really want to try this! Thanks. You should try, and lemme know how it was k.
Boondi is a deep fried crispy Indian snack prepared from gram flour and few spices. You can add it in yoghurt too. This will be available in Indian stores. You can omit it if you can’t find it.